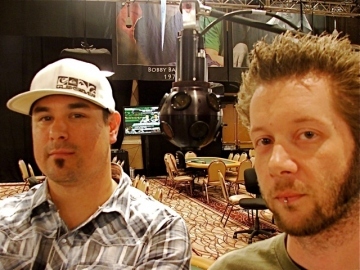 All 360 began recording non-televised final tables at the start of the Series. ESPN.com began sporadically featuring the interactive, hyper-panoramic footage online a few weeks ago. For the main event, they’ve had one 360-cam affixed to a truss above ESPN’s main feature table, while “table hopping” with the other. The cameras act like a robotic eye-in-the-sky, essentially creating a dome of visibility above and around a table, with individual internet viewers able to shift the camera’s direction and zoom at will. Viewers can zero in on the felt, cards, specific players, even fans behind them, to see exactly they want to look at however closely. Anyone can play All 360’s footage on the web. But PC users can maximize the experience by downloading a special (free) video player, which provides higher resolution images with smoother rendering. This software add-on can even split the screen multiple times so you can watch separate, customizable views simultaneously … as many windows as your RAM can handle! See two players head on, even when they’re facing off from across the table, say a 3-seat vs. a 7-seat, for example, with a third window focused on the flop … all while watching another player shuffle chips in a distinct way when he thinks no one is looking. 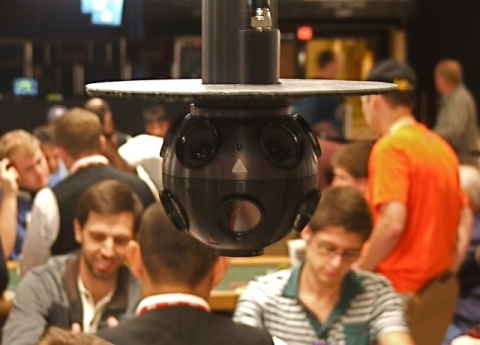 The 360-cam first appeared over a poker table in April, during the WPT World Championship at Bellagio. It was a dry run essentially, in preparation for the WSOP, with All 360 allowed to video anything up to the Final 6. Excited about the potential of what he was seeing, Hellmuth asked Egelhoff how he might be able to help. Before long, Hellmuth became an active partner in All 360, where his role, beyond endorsing the product, has included helping open certain doors in the industry, advising on start-up business strategies, and providing back-office support. “This technology is absolutely the future of watching poker. I’m proud to be involved with it,” Hellmuth says. To bring 360-degrees of tournament coverage from idea to prototype, Egelhoff worked with people from Immersion Media, a key company behind Google Earth, to take what they did with still cameras atop Google’s funny looking mapping cars and customize a video version for poker environs. They first had to figure out how to mount the device upside-down. Then they had to adjust focal lengths by replacing lenses designed to shoot 60 feet out (to infinity) with something better suited for capturing live action just a few feet away. From there they had to rewrite software, and would later have to re-rewrite it to make it compatible with other websites, such as ESPN.com. 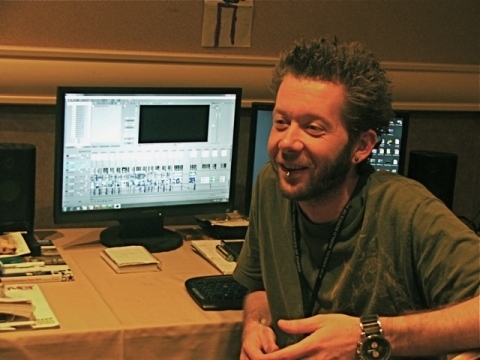 Egelhoff and Gusman formed their company in January, but Hellmuth was the one who helped them get their cameras in front of the right people at Harrah’s and ESPN. They’d all finalize a deal for this WSOP in mid-May, two weeks before the first shuffle-up-and-deal. (ESPN gets to air All 360’s footage from WSOP tables first, but All 360 retains the video rights thereafter). 360 degrees of separation: Egelhoff went from CardPlayer A/V grunt to running his own company; yet he still finds himself hunkered down at the Rio into the wee hours during the WSOP. If the cameras at the WPT Championship were version 1.0, the WSOP has seen version 1.5, Egelhoff says. They’ve increased resolution, added a light shield, and have continued to improve back-end software and their video player. While some TV stations have begun to experiment with the same technology — NBC did an episode of the Today Show where viewers could move around the stage, and a Canadian sports station has tried it at hockey games — poker is one area where the cameras seem to have immediate applications, and thus a market where developers are focussing much of their creative and technical energy. All 360’s cameras already work for watching players at a table. But so much more can theoretically be added with relative ease — allowing viewers to get more information about whatever it is they’re mousing over, for example, whether that be additional player stats or interactions with a table advertiser. One of the most obvious and immediate uses is in poker is training. While players have studied poker on TV like old-fashioned game films for several years now, the search for tells just hit a new level with this technology. Online training site Deep Stacks Live recorded and streamed a live cash-game session earlier this month at the Hard Rock, with Mike Matusow leading the instruction. â€œThis technology gives our students unparalleled individualized access to the classroom,” says Chris Torina, CEO of DeepStacks Live. Deep Stacks will be recording and streaming another live training session later this month, July 25. As cameras inevitably get smaller and processing power gets faster, it’s only a matter of time before new interactive (and presumably monetizable) features get added. Hence the growing belief that 360 coverage has a long and promising future in poker … even if few at the moment are exactly sure how. Signs point to yes: Look into the new 360-cams showing up over poker tables and ask if you are seeing the future. Phil Hellmuth thinks you are. That day may be a while off. The cameras All 360 is currently using cost more than $100,000 each. But supposedly they are almost ready — a few months from testing — with completely redesigned hardware that requires fewer lenses (6 instead of 11), is smaller and lighter, produces better quality video, and, as things tend to go with high technology, costs less. Meanwhile, Egelhoff has been contemplating the software necessary to link multiple 360-cams together to expand their coverage area beyond a single table, to entire regions of a poker room. Current agreements with individual patent holders give All 360 exclusive rights in casinos and gaming environments. That leaves open a myriad of possibilities beyond the poker table. Security is an obvious future application to explore, and the cameras have already proven a hit for concerts, allowing online audiences to vicariously step onto the stage. Hellmuth brought the All 360-cam to his Main Event “Sky Suite” at Aria, showing its potential use for casino room tours. Recording nightclub activity and pool parties 360-style would likely appeal to thousands, if not millions of Vegas voyeurs. More immediately though, their next challenge is live-streaming tournament tables. This will require not just further software tweaks, but also additional approval from Nevada gaming regulators. All 360 is currently in active discussions about how this all might work for the 2011 WSOP, while also talking with the WSOP-Circuit and a few international poker tours eager to take the technology worldwide. See 360-degree coverage from the 2010 WSOP and download the special player at All360Poker.com. Follow them on twitter @All360Poker. I knew I recognized Danny from somewhere! Seems like his company is really going places. Congrats to him.